Mister Whistler is a little absent-minded. And while it's perfectly understandable to be like that when you've always got a song in your head and a dance in your feet, it can make life a little tricky at times! When Mister Whistler is called to visit his Great-Aunt Lydia, he heads straight to the train station and buys a ticket. As a song races around in his head and his feet dance him around the platform, he absent-mindedly slips his ticket between his teeth. And then … can't find it again. He checks his coat pockets. He takes off his coat so he can check his jacket pockets. He takes off his jacket so he can check his waistcoat. He takes off his waistcoat so he can check his shirt … Before long, he's down to nothing more than his underwear! All the while he's dancing up a storm. By now, the other people on the platform are watching in amazement, clapping and cheering at his incredible dance performance, and dropping money into his hat in appreciation. At last, his ticket flies loose from his teeth and Mister Whistler grabs it. But now he has to catch the train, so he quickly dresses, jumps on the train … and … well, I won't spoil it for you, but let's just say he encounters a few more problems with that pesky ticket! This is a fun, endearing and beautifully composed book by two stars of the children's book world. 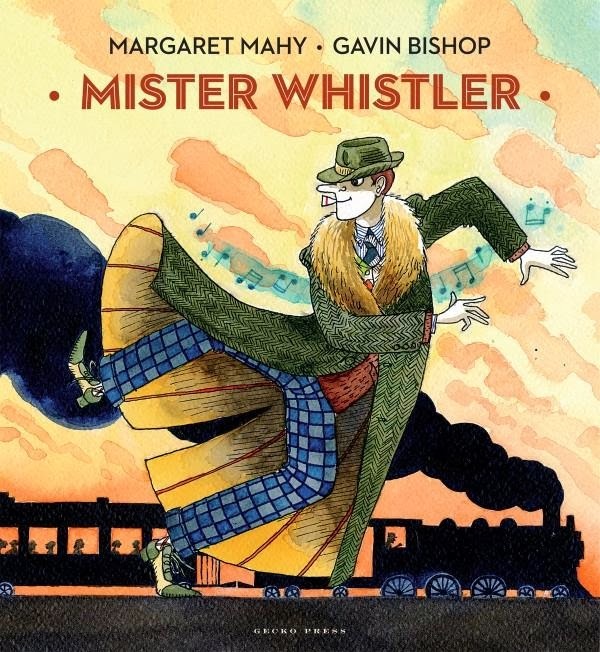 Margaret Mahy, who sadly died in 2012, is one of the world's best-loved children's authors and winner of the Hans Christian Andersen Award for her contribution to children's literature, while Gavin Bishop is an equally talented, award-winning illustrator. Their skill and attention to detail is evident in every page. A whimsical, light-hearted read that's guaranteed to engage younger readers and put a smile on your face too.